Welcome to Philadelphia's Number One Video Pipe Specialist Company. Mr. D's Plumbing and Heating has been serving Philadelphia and the Tri-State for over 30 years. Mr. D's is fast, reliable and affordable. Watch our promo video below! Our 24 Hour Service gives you peace of mind during this times of emergency. Simply give Mr. D's a call and we will be out shortly to fix your problem! 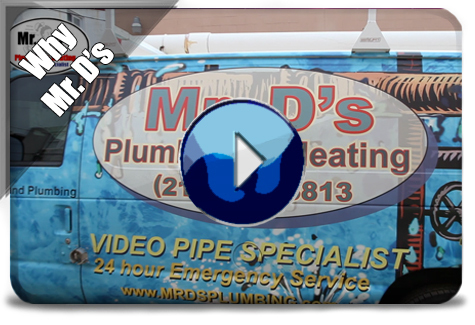 Mr D's is a leader in pipe video and one of the few local companies that offer this service. Save thousands of dollars by calling us before you dig. "I was referred to Mr. D's Plumbing by a friend of mine, and was extremely satisfied with their services. I will refer you to anyone who needs an experienced and skilled plumber." - Dana M.
No more leaks or plumbing problems, I am 100% happy with their service. Mr. D's was professional, very polite to me and my family. - Josh G.
Our heater wasn't working, so we called Mr. D's and they responded quickly. They came out and fixed the heater at my house. They were very friendly and did a great job. We could not be more satisfied and we will definitely call Mr. D's for any future needs. - Anthony S.
Copyright © 2013 Mr Ds Plumbing & Heating Inc. All Rights Reserved.